The happy mother and her new cubs. WESTWOOD — In an exciting development that has captured the hearts of the entire student body, the faculty at UCLA have confirmed the birth of two bronze Grizzly cubs by the legendary Bruin Bear, early Tuesday morning. Spectators were, to say the least, shocked at the unexpectedly surreal event, as the Bear statue had shown absolutely no indication of pregnancy throughout these last few months. Doctors on hand at the Ronald Reagan Medical Center’s Emergency Topiary & Sculpture Ward were immediately rushed to the scene by helicopter. This tragic mix-up ended up wasting extremely valuable time, as word had just come in from Bruin Walk that the Bear’s contractions were well-underway. Luckily, the actions of UCLA security guard Doug Kwan kept the Bruin Bear from looking as beat up downstairs as a disfigured metal road pizza being warped by grenade shrapnel: With only minutes before the eminent birth, Doug had put in a call to the Department of Metallurgy and Smithery, who swiftly dispatched two trained welders. The statue was adopted by the school in 1944, after the real live bear kept in shackles and chains in its’ place was offered a much better job in a country-bluegrass jamboree of sorts. He played the bucket with a string on it. They successfully toured the West, and the Northern Southwest, and Eastern Midwest, but were tragically gunned down in the Southern South for fraternizing with black bears. In his memory, a new bear was adopted by the University. But having learned from their mistakes, this bear would be shaved, shellacked, coated, bronzed, re-bronzed, covered in gold, chocolate, chocolate-gold, then bronzed again, so that such a loss would never be experienced by the school again. Against all odds, the new bear surprisingly survived for 10 long minutes. Professors in the Ghosts and Ghoulish Studies Department have alerted us to the existence of local legends which allege that the dying screams of the once proud beast can be heard forever echoing within the eternal resonance achieved through true inner-continuity. 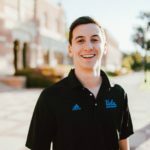 The twins themselves – named Luang Yu-Ching and Darius Secundus – have already tripped four UCLA tour guides who were walking backwards whilst talking about how safe the campus is to a mix of extremely bored and extremely nervous parents. This statue now makes a lot more sense in context within the UC concept. Clearly, the adult Bear symbolizes the University of California flagship and namesake campus up in Berkeley, while the children bears represent the extension campus grown from the LA Normal School, all those years ago.